Formal free trade negotiations between Canada and China have been put on hold, at least for now. Prime Minister Justin Trudeau and Chinese Premier Li Keqiang emerged from their private meeting in Beijing on Dec. 4 without announcing a plan to pursue an agreement. According to reports, the meeting between Trudeau and Li took longer than expected, and a joint press conference scheduled after their meeting was cancelled at the behest of the Chinese side. The Canadian Press reported that Chinese security guards blocked photographers from The Canadian Press and even the Prime Minister’s Office from taking photos of Trudeau and Li as they walked a red carpet after their meeting. There was also an angry exchange between a Chinese foreign ministry official who berated a Canadian diplomat for not bringing the passports of reporters travelling with Trudeau, to which the diplomat fired back. Following the talks, both Trudeau and Li said the two countries will continue exploratory discussions toward a free trade deal. “Canada is committed to moving forward on progressive trade deals that involve things like chapters on gender, on the environment, on labour,” Trudeau said. 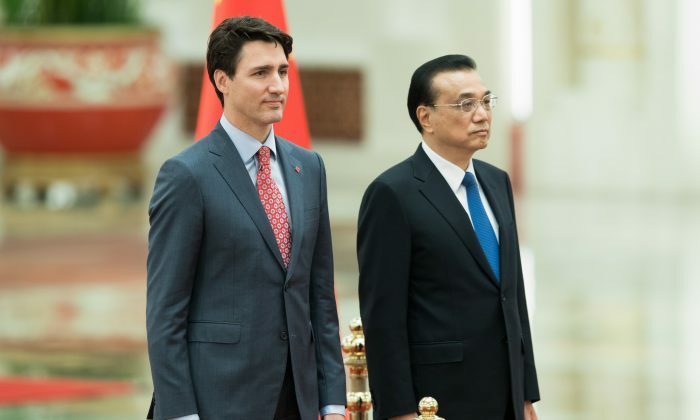 According to the Globe and Mail’s Steven Chase, who is reporting from Beijing, an industry source has said that among points of disagreement between the two sides is Ottawa’s insistence on including standards for labour and the environment in any deal. China has been eager to enter into a free trade agreement with Canada, while insisting that human rights issues and conducting national security reviews before allowing China’s state-owned enterprises to take over key Canadian companies be kept out of the talks. Editorials in China’s English-language state-owned media, including the China Daily and Global Times, seem to be pushing the idea that pursuing a free trade agreement with China is in Canada’s interest since Canada has been facing challenges in NAFTA re-negotiations with the United States. The Liberal government, which has touted a potential free trade agreement with China since coming to power, made no mention of such talks in its announcement of the prime minister’s trip to China. Results of government consultations on a free trade deal with China published last month showed that Canadian businesses were sceptical that an agreement would address the fundamental problems of doing business with China, including adverse affect on Canadian jobs, China’s lack of rule of law, unfair competition from China’s state-owned enterprises, and lax labour and environmental regulations in China that don’t create a level playing field for all parties, among other concerns. The National Post’s front page on Dec. 2 featured the headline “Dealing with the red devil,” with a column by Terry Glavin sounding a warning regarding the government’s pursuit of closer relations with China. “[A]s a ‘trade partner,’ Beijing, with its many friendly corporate dependencies in Canada, has behaved from the outset more like an embezzler,” wrote Glavin. “Australia and New Zealand are desperately attempting to extract their democracies from Beijing’s money and influence,” he noted in the column.